It takes a “puddle jump” of approximately 33 km to reach……..
….Eckernförde and the Baltic Sea. The North and Baltic Sea, the Treene and the Baltic-Sea-Fjord-Schlei. Schleswig (approx. 13 km) is the place to go to experience cultural specials: the Castle Gottorf, the Haithabu Viking-Village, the City Museum, the Dome, and the Memorial Church of Idstedt. Children can enjoy a wonderful day in the Theme Park (approx. 12 km). Opportunities to go and ride ponies or to learn how to ride ponies are given in the neighbouring communities. 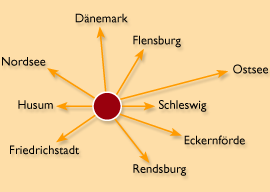 It is also possible to reach Flensburg, Husum, Sylt, Schleswig and Kiel by train. The trains are departing every hour and it takes only 1 minute to reach the train station. There are several opportunities to go swimming: the open-air pool Tarp (approx. 12 km), the swimming pool Schleswig (approx. 12 km), the lake in Lürschau (approx. 6 km). Please click on the map in order to apply a travel route.